so for now i have a few questions that you guys may be able to answer. AWESOME builds and info on this section of the forums btw. All the info I have absorbed over the last couple days have been invaluable. 2. is there another sub-frame, sleeker thinner one that will bolt right up? 3.for tucking wires under the gas tank(for the ones not rerouted to say under a seat or not eliminated) is there any issues with heat exposure to that wiring? Last edited by trurider26; 03-12-2012 at 08:43 PM. love it, now lets see it! as far as subframes.... i don't think anything is a direct bolt on - but it's a fairly easy on to mod and build your own. but i thought you said you wanted to retain the trunk space? look at buel lights - they're 4 inchers i think, and they look pretty damn good - but won't break the bank. I'm still in a holding pattern for now, headlight hunting has proven to be a bit challenging. Hasn't helped that bike week in Daytona just started last Thursday, alot of the shops are semi closed/weird hours to attend the weeks festivities and possible extra sales opportunities. I do have a new question tho, whats difference between a streetfighter and a cafe racer? cafe's are also usually smaller bikes... clip-ons... not edgy, not too aggressive. but really there's really no rules when it comes to fighters.... if you're building it, then it's a fighter. Something else that I have noticed in my shopping for a headlight at my local bike shops. 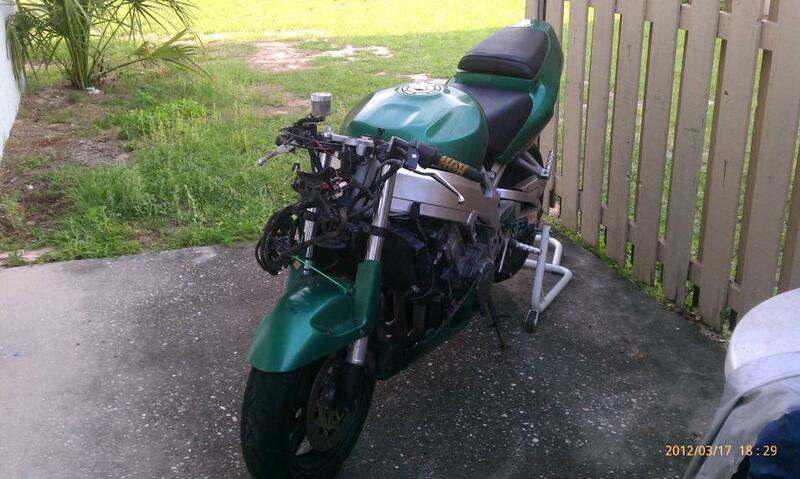 As soon as I say I plan on losing my fairing and going with a naked style bike. They all show me the same recycled low lighting ebay special 'streetfighter mask' I do have one that was given to me from a buddy, but he said the visibility was horrible with it. I like to make sure i'm seen when I ride, a lot of retiree's and dark roads in central florida. Headlight assembly came in, I went with the 7" single headlight from aztec8.com. I love the look of the double but with the sheer size of my tank the big single and it flows together better. 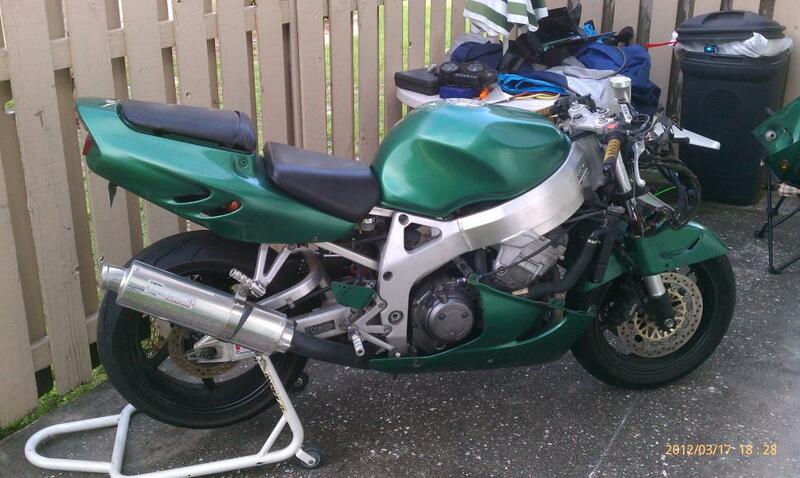 Only took down the front fairing, speedo, and front lighting/turn signals. My car ate up most of my day. As you can see from the photos, this is a porch job lol..unfortunately no garage. At least with it so close by I can work on it little by little as soon as I'm freed up from the lifes regular neccesities. My original thoughts of saving my original parts have some what gone out the window. I will be crafting a belly pan out of either the lower fairing or using it as a mold for a fiberglass one. Wiring doesn't look entirely too bad to relocate. Thats all for today, thanks for the support, inspiration and ideas in advance. that frame looks awesome! looking forward to seeing where you go with this! do work!! what do you got planned for the exhaust?....... chop saw or new can? Last edited by colorado_steve; 03-19-2012 at 09:20 PM. who cares? build something you love and call it whatever you want!!! so i put in a few hours today on it, removed the fairing/speedo mount bracket, moved almost all the wiring to the right of the bike. the plan will be to mount 90-95% of it in front of the air box, there is enough room for me to pull it off and not have anything hang out anywhere. I think i'm gonna go with a vapor speedo, the original is just waay to clunky to try and remount. the can i'm gonna probably get chopped or possibly straight piped similar to what colorado steve has or conrice. still on the fence. i rode it around for about a month with the can off, super throaty but i didn't like the sound at higher speeds on the highway. plus i was told to be careful of the lack of backpressure with running it that way. once i get my wiring stuffed and mounted i will upload some pics, either tomorrow or the day after.